Senator Bala Muhammed na im Nigeria election office finally declare winner of di govnorship election for Bauchi state, north east part of di kontri late Monday night. Independent National Electoral Commission declare say di main opposition Peoples' Democratic Party - PDP candidate Bala Mohammed wey be former FCT Minister win di current Govnor Muhammed Abubakar wey be di candidate of di ruling All Progressives Congress -APC. Di Returning officer Professor Kyari Mohammed return oga Bala Muhammed as di Govnor-elect of Bauchi State afta im score total of 515,113 votes while di Govnor 500,625. Even sef Govnor Abubakar don sama congratulobia give Senator Muhammed as Govnor-elect. 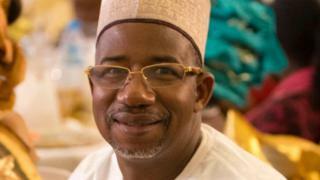 I wish to congratulate my brother, Senator Bala Mohammed on this victory at the polls. I am delighted to note that in-spite of the intensity of the campaigns in our dear state, a peaceful election took place without bloodshed. Remember say Court for Abuja on Monday troway di case wey Bauchi state Govnor Muhammed Abubakar file make Nigeria election office stop to count and announce results from Tafawa Balewa Local Goment Area. Independent National Electoral Commission bin no fit complete Saturday 23 March extra election to take add to di 9 March vote for di state sake of dis court order. Wen collation of 23 March results end for Bauchi state, north east Nigeria and di Peoples Democratic Party govnorship candidate Bala Mohammed dey lead wit 6376 votes for di result of di re-run election wey happun on Saturday.